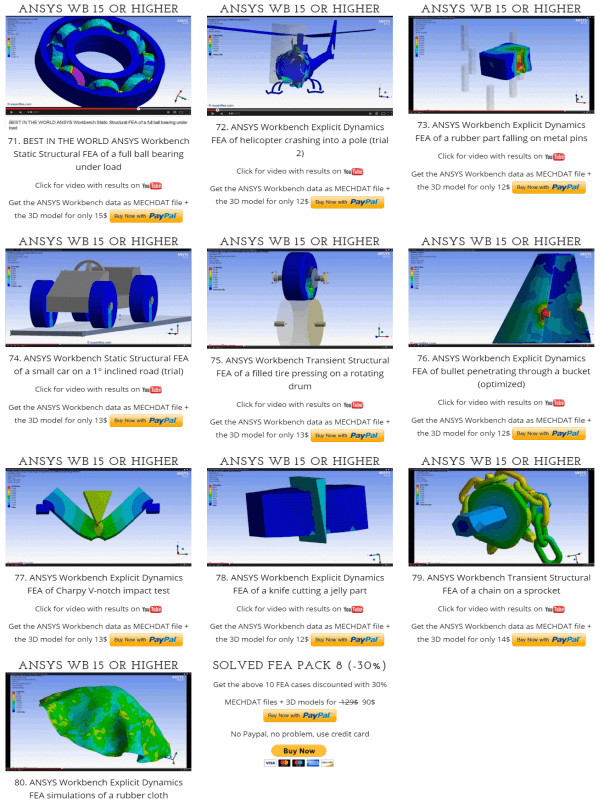 If you are interested in running the FEA scenarios seen underneath, you can download the respective ANSYS project data (as MECHDAT files) to see the settings we used for materials, mesh, contacts, loads, time steps, solver etc., together with their 3D models. On this page you find only MECHDAT files and 3D models; the PDF tutorials are found on the pages seen in the menu! ⇒ for Explicit Dynamics: right click Solution, Clear Generated Data, then go to Analysis Settings, Step Controls, Resume From Cycle = 0, Solve. &star; Pay attention to the mentioned ANSYS Workbench version, because older versions will not open the files!